One of the most important aspects of aircraft engine maintenance is having a clear understanding of how jet engines work and methods used to clean them. 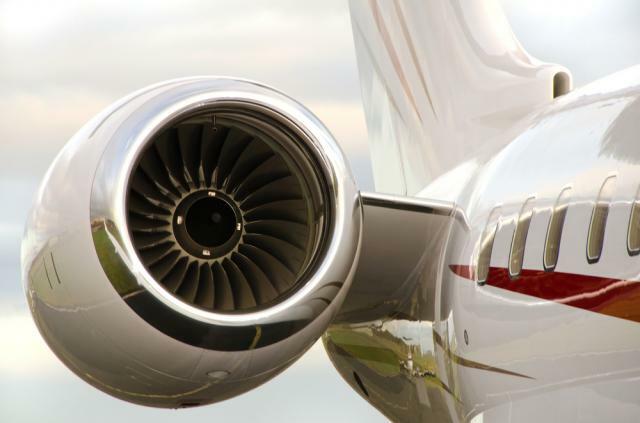 Jet engines, also known as gas turbines, move an airplane by producing tremendous thrust. There are many aircraft engine parts that work together to keep flying plane airborne. The fan, normally made of titanium, draws in large amounts of air into the engine, speeding the air up and sending it in two directions. Some air is directed toward the core of the engine while other air is sent through ducts to the back of the engine, producing the force necessary to propel the plane. The compressor, made up of fans with many blades attached to a shaft, compresses the air, creating air pressure. That air pressure creates energy, which is then forced into the combustion chamber. Fuel is injected into the combustor, and when the fuel combines with the compressed air, it burns, producing gasses. The heated airflow is then pushed into the turbine whose blades begin to turn. The shaft attached to the turbine turns the blades in the turbine as well as the intake fan, removing some of the energy around the fan and compressor. Adequate aircraft engine maintenance requires an understanding of not only all the parts in a diesel aircraft engine, but what role they play in operating the plane. As part of aircraft engine maintenance, washing the engine offers better efficiency. Although an aircraft engine functions at temperatures that will literally vaporize water, engine grease and other substances can build up inside the engine, which reduces the efficiency of the diesel aircraft engine. Therefore, as part of aircraft engine maintenance, it is recommended you clean your jet engine on a regular basis. One of the best ways to clean an engine as part of your aircraft engine maintenance is by flowing water, and possibly detergent, through the engine to clean the turbine blades and core. This reduces carbon build-up and increases operating efficiency. When an engine is overhauled, aircraft mechanics often wash the plane using detergents and solvents mixed with water; however it is possible to wash an engine while it is still on the plane. Visit us at www.covingtonaircraft.com for more information about airplane engine maintenance, overhaul, and repair for both radial and turbine engines. You can also find out about us on Facebook and LinkedIn. What Happens When Lightning Hits an Airplane? Does it Mean an Airplane Engine Overhaul? What Is An Aircraft Engine Light Overhaul? It is important to remind that applicable AMM gas path cleaning (washing) needs to be followed. The concerns is contamination of the oil system and fuel system sense lines (air) with water or detergent. There maybe a need to blow out the sense lines and analysing the oil for water content. Depending on the results, post engine wash engine ground run to raise the oil temperature to its operating levels, there might a need to change the oil.